The widespread and abundant magmatic rocks emplaced in the High Arctic of Canada, Svalbard, Franz Josef Land, and Northern Greenland during the Cretaceous (Fig. 1) are known collectively as the High Arctic Large Igneous Province (HALIP, e.g., Buchan and Ernst, 2006; Ernst and Bleeker, 2010; Tegner et al., 2011; Jowitt et al., 2014; Corfu et al., 2013). Due to its inaccessibility, the HALIP is one of the least studied igneous provinces on Earth, with very few high-precision radiometric ages for the basaltic magmas. Available age constraints for the mafic lavas and intrusives (Estrada and Henjes-Kunst, 2013; Estrada, 2015; Evenchick et al., 2015; Jokat et al., 2013; Kontak et al., 2001; Thorarinsson et al., 2011; Villeneuve and Williamson, 2006) have shown a protracted duration of magmatism (>50 Myr) in this region that is inconsistent with the current LIP definition (e.g., Tegner et al., 2011), calling into question a genetic model dominated by a mantle plume. Here we provide the first high-precision U–Pb ages of mafic intrusive sheets from Axel Heiberg and Ellesmere Islands. Combined with published geochronology, the data allows us to closely examine the temporal and spatial relationships between tholeiitic and alkalic magma types, in order to evaluate the validity of the plume hypothesis for the formation of the Canadian manifestation of the HALIP. We use quantitative, modelled estimates of lithospheric “lid” thicknesses during magma generation to track the spatial and temporal complexity of lithosphere evolution in this region, developing an alternative explanation for this continental magma genesis via edge-driven convection. 71 mafic igneous rocks were collected and analyzed by solution ICP-MS to collect a full suite of trace elements. Geochemical results align with previously reported studies in that there are tholeiitic and mildly alkalic compositions. Rare earth element (REE) plots (Fig. 2a) show averages for the two magma types occurring as both intrusive and extrusive rocks in the Sverdrup Basin. The tholeiite REE patterns parallel those of typical E-MORB, but with all REEs enriched by a factor of 2 to 8, indicating variable amounts of olivine fractional crystallization prior to eruption. There is a strong distinction between the LREE/HREE enriched alkalic basalts and the less enriched tholeiites, This can be quantified using the REE inter-element ratio [Sm/Yb]N ratio serves as a proxy for the depth of melting, as Yb is more compatible in garnet than Gd. Melts generated at greater depths, retaining garnet in their source, have higher [Sm/Yb]N (Ellam, 1992). The variation in [Sm/Yb]N of all reported Sverdrup Basin mafic magmatism defines two distinct peaks (Fig. 2b), which indicates two distinct conditions of magma generation of the tholeiitic and alkali suites. These distinct magma generation reservoirs are quantitatively modelled in Dockman et al. (2018) following REE inversion modelling technique detailed in McKenzie and O’Nions (1991). Figure 2 a) Average REE patterns for the Canadian HALIP samples, normalized to chondrite (Sun and McDonough, 1989). Alkali lavas (Hassel Fm. from Estrada, 2014) and intrusions are parallel, while Audhild Bay lavas are more enriched in LREE. The average REE pattern for the tholeiite intrusions of the HALIP parallel the average of the Axel Heiberg Island lavas (e.g. Strand Fjord Fm and Isachsen Fm. basalts, from Jowitt et al. 2014). OIB and EMORB from Sun and McDonough (1989). Mull lavas from Kerr et al. (1999). b) Histogram and kernel density plot of [Sm/Yb]N variations for all reported Sverdrup Basin magmatism with full REE analyses, displaying two clear geochemical modes. Kernel density estimator plotted using Vermeesch (2012). [Sm/Yb]N chondrite normalized (Sun and McDonough, 1989). Data from Estrada (2014), Estrada and Henjes-Kunst (2004), Evenchick et al. (2015), Kontak (2001), and Jowitt et al. (2014). Six new U–Pb and four 40Ar/39Ar ages of mafic lavas and intrusive sheets range from 120.9 ± 0.9 Ma to 78.4 ± 0.1 Ma, which is within the published timespan of the HALIP. The U–Pb ages are the first analyzed from the mafic intrusions of Axel Heiberg and Ellesmere Islands. The new geochronology, compiled with all recently (post-2000) published ages, detail a > 50 Myr duration of magmatism (128 to 77 Ma). The data appear to cluster into three temporally distinct main pulses, calculated by full width at half maximum: 124–120Ma, 99–91Ma, and 85–77 Ma (Fig. 3; for complication of ages, see Supplementary Table 1 from Dockman et al., 2018). It is hard to rule out over- and under- sampling effects in the age population. Many more reliable ages, covering the entire basin, would need to be collected and analyzed to confirm these pulses. However, the resolvable magmatic pulses correspond to basin-wide stratigraphic unconformities related to thermal uplift (Embry and Beauchamp, 2008). Figure 3 U-Pb and 40Ar/39Ar age compilation and kernel density estimation curve of ages from this study (n = 10; Dockman et al., 2018) and previously published ages from: Corfu et al. (2013); Estrada (2015); Estrada and Henjes-Kunst (2013); Evenchick et al. (2015); Jokat et al. (2013); Kontak et al. (2001); Villeneuve and Williamson, (2006). See Supplementary Table 1 from Dockman et al. (2018) for a tabulated compilation of ages, numbered according to the figure. 2σ errors reported as width of box. Kernel Density Estimation (after Vermeesch, 2012) bandwidth set to 1.5 to equally weight the uncertainty of each reported age. Biostratigraphy of extrusive formations from Tegner et al. (2011) and references therein demonstrate the overlap of the extrusive units with magmatism peaks. Possible peaks in the age distribution indicated, with pulse length calculated as full width at half maximum. Additional precise U-Pb ages of 95.18 ± 0.35 and 95.41 ± 0.12 Ma for a dolerite dyke and sill, respectively, (Kingsbury 2018), published subsequent to Dockman et al. (2018), provide additional geochronology for the 95 Ma pulse. After rigorous screening for crustal contamination using trace elements and Sr-Nd isotope systematics, 24 mafic rocks (with>5 wt% MgO) from this and previous studies (Estrada, 2015; Evenchick et al., 2015; Jowitt et al., 2014; Kontak et al., 2001; Mitchell and Platt, 1984), were used for REE inversion modelling (McKenzie and O'Nions, 1991; White and McKenzie, 1995; Gibson and Geist, 2010). The purpose is to obtain an estimate of the depth of the top of the melt column, where upwelling mantle encounters the rigid lithosphere (Mechanical Boundary Layer), which defines the lithospheric “lid” thickness at which depth upwelling mantle could no longer rise. We also constrained the extent of melting from the calculations. The resulting estimates for lithospheric “lid” thicknesses for magmas produced across the Sverdrup Basin vary from 40 to 68 km. 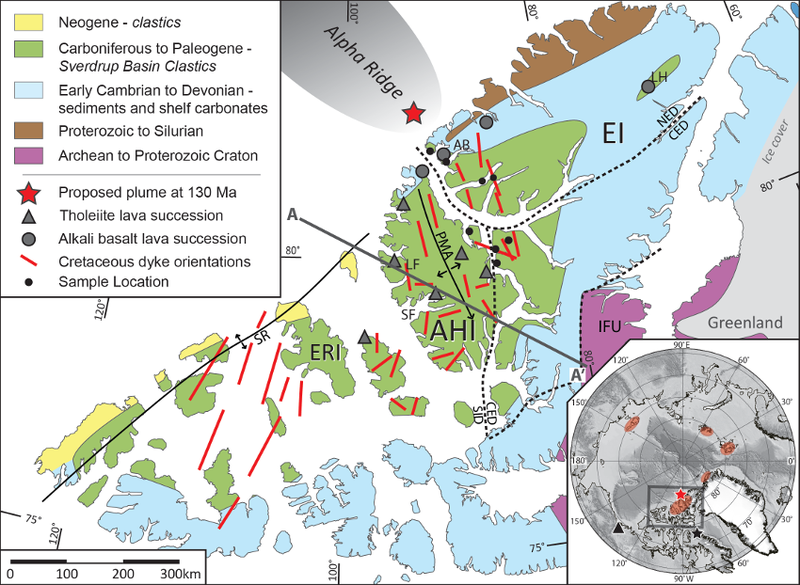 Six strongly-depleted tholeiites from Axel Heiberg Island and western Ellesmere Island appear to have been generated beneath quite thin lithosphere (40–42 km), which agrees with the depth to the mantle along the basin axis derived from seismic (Sobczak et al., 1991). Estimates of lid thickness over the 50 Myr duration of mafic magmatism within the Sverdrup Basin reveals that there is no correlation between the age of magmatism and lithospheric thickness. For instance, in both the 81 Ma and 95 Ma pulses, lid thickness ranges widely, from 40 to 68 km, with no systematic trend. The absence of any temporal trend in lid thickness, both within individual magma pulses, and over the entire duration of the Sverdrup magmatism, is inconsistent with trends documented in other LIPs. Typically, where clear trends in magma compositions are evident in LIPs, a plume erodes the thermal boundary layer, thinning the lithosphere and causing a transition from alkali basaltic magma production during the initial phases of melting, through to the production of higher volume tholeiitic magmas in the later stages (e.g., Kerr, 1994; Hamilton et al., 1998; Thompson et al., 2001). The results from the Sverdrup Basin magmatism document the reverse situation, with the first main magma pulse at 122 Ma producing exclusively tholeiitic basalts, generated beneath thin lithosphere (42–58 km). In geochronological assessments of high-volume Large Igneous Provinces (LIP), earlier studies (pre-2000) tend to overestimate the duration of magmatism (e.g., discussions in Paraná; Deccan; Siberian LIPs – outlined in Renne and Basu, 1991; Hamilton et al., 1998; Thiede and Vasconcelos, 2010). Applying modern refined analytical techniques, some mantle plume-related LIPs, such as the Deccan traps, are found to have erupted the majority of their basaltic magma in 1–3 Myr (Schoene et al., 2015; Renne et al., 2015), with significantly reduced volcanic activity that can persist for up to 10 Ma after the major eruptive event (Gibson et al., 2006). Until now, the paucity of reliable ages for the magmatism in the Sverdrup Basin did not allow a consensus on the timing and duration of its formation. The 10 new U–Pb and Ar/ Ar ages presented here, along with recently published data, allow us to better constrain the spatio-temporal distribution of magmatism within the Sverdrup Basin. While we do not deny the possible influence of a mantle plume in initiating HALIP magmatism (e.g., Buchan and Ernst, 2006; 2018), another mechanism is required to explain the observed lithospheric thickness variations of the >50 Myr of pulsed eruptions. One mechanism to produce the spatial, geochemical, and chronological relationships of basaltic magmatism across the ~1000 km long Sverdrup Basin could be the juxtaposition of thick cratonic lithosphere beside the thin rifted lithosphere of the Sverdrup Basin. This is an optimal situation for magma production via the alternating effects of two types of edge-driven convection (EDC) described by Kaislaniemi and van Hunen (2014): EDC sensu stricto (s.s.; King and Anderson, 1998) and EDC with shear (w.s.). The flow of subcratonic asthenosphere up the basal-lithospheric gradient toward thinner lithosphere creates a long wavelength convection cell, with secondary convection cells (eddies) on the lee side of the craton edge (Fig. 4 & Kaislaniemi and van Hunen, 2014), beneath the sub-basins created during rifting. Coupled with adiabatic decompression melting and erosion of the thermal boundary layer, these eddies create a peak-and-pit topography at the base of the lithosphere abutting the craton. This small-scale gradient in lithospheric thickness could have a profound and complex influence on the chemistry and geographic distribution of magmas. Lithospheric erosion can progress to ~40 km (Kaislaniemi and van Hunen, 2014), which is significant enough variation in lithospheric thickness, as modeled by REE inversion, to account for the generation of bimodal alkalic and tholeiitic magmas in the Sverdrup Basin. 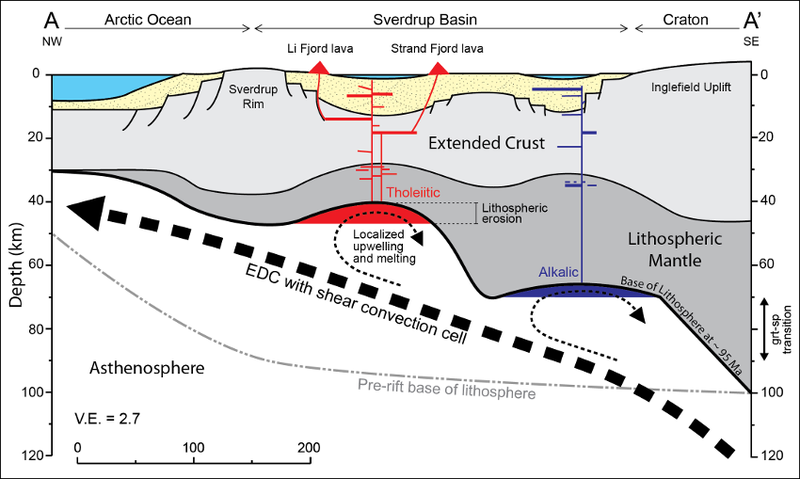 The lithospheric cross section of the Sverdrup basin (Fig. 4; map view Fig. 1) depicts an idealized EDC with shear cell eroding the subcontinental lithospheric mantle during the 95 Ma pulse. Between the thick craton of the Inglefield Uplift and the thin lithosphere of Strand and Li Fjords in the basin centre, a second magma generation zone may have formed nearer the craton beneath Ellesmere Island. The thicker lithosphere would generate the alkalic magmas that injected into the country rocks near the basin margin (Fig. 4). As magmas generated under thinner lithosphere experience higher melt fractions, the magma volume would be highest in the basin depocentre and lower volumes on the margin. Figure 4 Schematic cross-section of the ca. 95 Ma Sverdrup Basin with inferred effect of EDC on the continental lithospheric mantle and magma generation. See Figure 1 for map view of cross-section. EDC thermomechanically erodes base of the lithosphere, potentially creating two distinct lithospheric thicknesses beneath the basin. Alkalic magmas formed under thick lithosphere experiences more melt below the garnet-spinel transition zone (70-90 km in this study). Sverdrup Basin from the Sverdrup Rim (SR) to the Inglefield Uplift (IFU). Large lateral thermal gradient and upwelling mantle—with shear—is generated by either sub-cratonic incubation or a distal plume. Pre-rift thermal boundary layer of 90 km (depocenter) to 100 km (margin) and crustal thicknesses (35 – 44 km) from Stephenson et al. (1987). Sverdrup basement structure adapted from Embry and Beauchamp (2008). Long axis of magma eddies into- and out-of page, ~200 km parallel to craton’s edge. If the plume persisted until 90 Ma, it may have been off the northern coast of Baffin Island (black star in Fig. 1 inset; Lawver and Müller, 1994), 900 km distant from the centre of the Sverdrup Basin. Upwelling mantle driving EDC w.s. could have been supplied from this distal plume, creating a substantial lateral temperature gradient. Such a distal plume would not exert primary control on the 91 and 85 Ma pulses of Sverdrup basin magmatism. This plume would also have been too distal to have been directly responsible for the later building phases of the volcanic Alpha Ridge. An 40Ar/39Ar age of 89 ± 1 Ma (plagioclase separate with Rank 1 reliability following our criteria, see full article) was obtained by Jokat et al. (2013) from an alkali basalt dredged from the Alpha Ridge. This age is >30 Myr after the 122 Ma pulse that is attributed to the continental breakup that dispersed the HALIP magmas across the circum-Arctic. A plume-derived Alpha Ridge would require a stationary plume be present off Northern Ellesmere Island for >30 Myr. 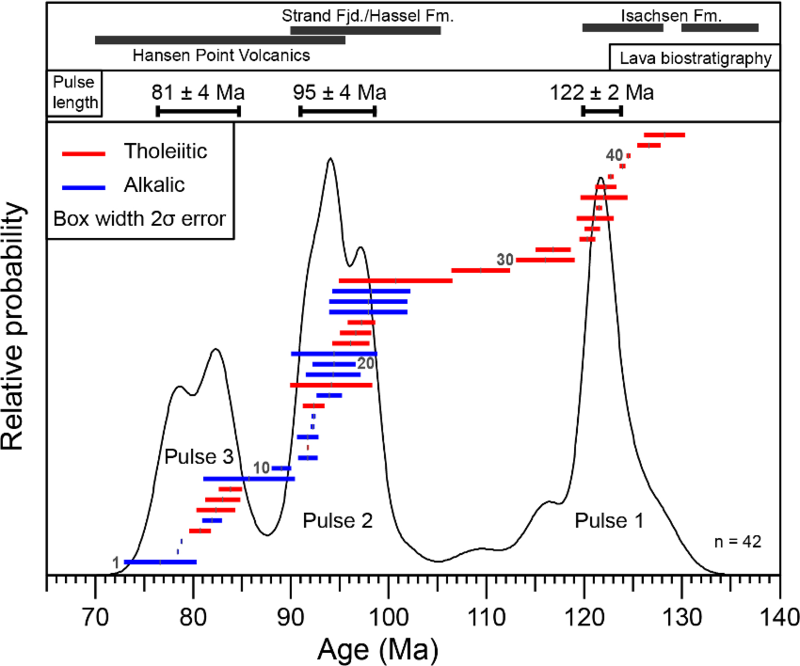 A thermal upwelling, such as a mantle plume, may have been the primary control on the first widespread tholeiitic pulse of the Sverdrup Basin basaltic magmas at ~128–120 Ma. However, the subsequent phases of melt generation, which are characterized by coeval alkalic and tholeiitic basalts, cannot be explained by a standard plume model. We invoke alternating modes of edge-driven convection (EDC) as the main influence on the magma genesis of the 99–91 Ma and 85–77 Ma. This model, including complications induced by lateral flow of hotter mantle beneath adjacent cratonic regions, is capable of explaining the complex juxtaposition of magma chemistries, in space and time, of the Sverdrup Basin lavas and intrusives. We therefore suggest that the ca. 128–120 Ma circum-Arctic tholeiites (e.g., this study; Corfu et al., 2013; Evenchick et al., 2015; Villeneuve and Williamson, 2006) are the only magmas that should be considered as part of a plume-derived, circum- Arctic large igneous province–the HALIP. Buchan, K.L., and Ernst, R., 2006, Giant dyke swarms and the reconstruction of the Canadian Arctic islands, Greenland, Svalbard and Franz Josef Land, in: Hanski, E., Mertanen, S., Rämö, T., and Vuollo, J. (Eds. ), Dyke Swarms: Time Markers of Crustal Evolution, Taylor and Francis Group, London, UK, p. 27–48. Buchan, K.L., and Ernst, R.E., 2018, A giant circumferential dyke swarm associated with the High Arctic Large Igneous Province (HALIP). Gondwana Research, v. 58, p. 39–57. Corfu, F., Polteau, S., Planke, S., Faleide, J.I., Svensen, H., Zayoncheck, A., and Stolbov, N., 2013, U-Pb geochronology of Cretaceous magmatism on Svalbard and Franz Josef Land, Barents Sea Large Igneous Province, Geological Magazine, v. 150, no. 6, p. 1127–1135. Ellam, R.M., 1992, Lithospheric thickness as a control on basalt geochemistry, Geology, v. 20, p. 153–156. Embry, A.F., and Beauchamp, B., 2008, Sverdrup Basin, in: Miall, A. (Ed. ), Sedimentary Basins of the World, Volume 5, Elsevier Ltd., p. 451–471. Ernst, R.E., and Bleeker, W., 2010, Large igneous provinces (LIPs), giant dyke swarms, and mantle plumes: Significance for breakup events within Canada and adjacent regions from 2.5 Ga to the present, Canadian Journal of Earth Sciences, v. 47, p. 695–739. Estrada, S., 2015, Geochemical and Sr-Nd isotope variations within Cretaceous continental flood-basalt suites of the Canadian High Arctic, with a focus on the Hassel Formation basalts of northeast Ellesmere Island, International Journal of Earth Sciences, v. 104, no. 8, p. 1981–2005. Estrada, S., and Henjes-Kunst, F., 2013, 40Ar-39Ar and U-Pb dating of Cretaceous continental rift-related magmatism on the northeast Canadian Arctic margin, Zeitschrift der Deutschen Gesellschaft für Geowissenschaften, v. 164, p. 107–130. Evenchick, C.A., Davis, W.J., Bedard, J.H., Hayward, N., and Friedman, R.M., 2015, Evidence for protracted High Arctic large igneous province magmatism in the central Sverdrup Basin from stratigraphy, geochronology, and paleodepths of saucer-shaped sills, GSA Bulletin, v. 127, no. 9/10, p. 1366–1390. Gibson, S.A., and Geist, D., 2010, Geochemical and geophysical estimates of lithospheric thickness variation beneath Galápagos, Earth and Planetary Science Letters, v. 300, p. 275–286. Grantz, A., Hart, P.E., and Childers, V.A., 2011, Geology and tectonic development of the Amerasia and Canada Basins, Arctic Ocean, in: Spencer, A.M., Embry, A.F., Gautier, D.L., Stoupakova, A.V., and Sorensen, K. (Eds. ), Arctic Petroleum Geology, The Geological Society of London Memoir 35, p. 771–799. Hamilton, M.A., Pearson, D.G., Thompson, R.N., Kelley, S.P., and Emeleus, C.H., 1998, Rapid eruption of Skye lavas inferred from precise U-Pb and Ar-Ar dating of the Rum and Cuillin plutonic complexes, Nature, v. 394, p. 260–263. Jakobsson, M., Mayer, L., Coakley, B., Dowdeswell, J.A., Forbes, S., Fridman, B., Hodnesdal, H., Noormets, R., Pedersen, R., Rebesco, M., Schenke, H.W., Zarayskaya, Y., Accettella, D., Armstrong, A., et al., 2012, The International Bathymetric Chart of the Arctic Ocean (IBCAO) Version 3.0, Geophysical Research Letters, v. 39, no. 12. Jokat, W., Ickrath, M., and O’Connor, J., 2013, Seismic transect across the Lomonosov and Mendeleev Ridges: Constraints on the geological evolution of the Amerasia Basin, Arctic Ocean, Geophysical Research Letters, v. 40, no. 19, p. 5047–5051. Jowitt, S.M., Williamson, M.-C., and Ernst, R.E., 2014, Geochemistry of the 130 to 80 Ma Canadian High Arctic large igneous province (HALIP) event and implications for Ni-Cu-PGE prospectivity, Economic Geology, v. 109, no. 2, p. 281–307. Kaislaniemi, L., and van Hunen, J., 2014, Dynamics of lithospheric thinning and mantle melting by edge-driven convection: Application to Moroccan Atlas Mountains, Geochemistry, Geophysics, Geosystems, v. 15, p. 3175–3189. Kerr, A.C., 1994, Lithospheric thinning during the evolution of continental large igneous provinces: A case study from the North Atlantic Tertiary province, Geology, v. 22, p. 1027–1030. Kerr, A.C., Kent, R.W., Thomson, B.A., Seedhouse, J.K., and Donaldson, C.H., 1999, Geochemical evolution of the Tertiary Mull volcano, western Scotland, Journal of Petrology, v. 40, no. 6, p. 873–908. King, S.D., and Anderson, D.L., 1998, Edge-driven convection, Earth and Planetary Science Letters, v. 160, p. 289–296. Kingsbury, C.G., Kamo, S.L. Ernst, R.E., Söderlund, U., and Cousens, B.L., 2018, U-Pb geochronology of the plumbing system associated with the Late Cretaceous Strand Fiord Formation, Axel Heiberg Island, Canada: part of the 130-90 Ma High Arctic large igneous province, Journal of Geodynamics, v. 118, p. 106-117. Kontak, D.J., Jensen, S.M., Dostal, J., Archibald, D.A., and Kyser, T.K., 2001, Cretaceous mafic dyke swarm, Peary Land, northernmost Greenland: Geochronology and petrology, The Canadian Mineralogist, v. 39, no. 4, p. 997–1020. Lawver, L.A., and Müller, R.D., 1994, Iceland hotspot track, Geology, v. 22, no. 4, p. 311–314. McKenzie, D., and O’Nions, R.K., 1991, Partial melt distributions from inversion of rare earth element concentrations, Journal of Petrology, v. 32, no. 5, p. 1021–1091. Mitchell, R.H., and Platt, R.G., 1984, The Freemans Cove volcanic suite: Field relations, petrochemistry, and tectonic setting of nephelinite–basanite volcanism associated with rifting in the Canadian Arctic Archipelago, Canadian Journal of Earth Sciences, v. 21, no. 4, p. 428–436. Okulitch, A. V., 1991, Geology of the Canadian Arctic Archipelago, Northwest Territories and North Greenland, Geological Survey of Canada, “A” Series Map, doi: 10.4095/213121. Renne, P.R., and Basu, A.R., 1991, Rapid eruption of the Siberian Traps flood basalts at the Permo-Triassic boundary, Science, v. 253, no. 11, p. 176–179. Schoene, B., Samperton, K.M., Eddy, M.P., Keller, G., Adatte, T., Bowring, S.A., Khadri, S.F.R., and Gertsch, B., 2015, U-Pb geochronology of the Deccan Traps and relation to the end-Cretaceous mass extinction, Science, v. 347, no. 6218, p. 182–184. Sobczak, L.W., Forsyth, D.A., Overton, A., Asudeh, I., 1991. Crustal Structure from Seismic and Gravity Studies, in: Trettin, H.P. (Ed. ), Geology of the Innuitian Orogen and Arctic Platform of Canada and Greenland. Geological Survey of Canada, pp. 71–78. Stephenson, R.A., Embry, A.F., Nakiboglu, S.M., and Hastaoglu, M.A., 1987, Rift-initiated Permian to Early Cretaceous subsidence of the Sverdrup Basin, in Beaumont, C. and Tankard, A.J. eds., Sedimentary Basins and Basin-Forming Mechanisms, Canadian Society of Petroleum Geologists, p. 213–231. Sun, S.S., McDonough, W.F., 1989. Chemical and isotopic systematics of oceanic basalts: implications for mantle composition and processes, Magmatism in the ocean basins. Blackwell Scientific; Geological Society Special Publication, 42. Tegner, C., Storey, M., Holm, P.M., Thorarinsson, S.B., Zhao, X., Lo, C.H., and Knudsen, M.F., 2011, Magmatism and Eurekan deformation in the High Arctic Large Igneous Province: 40Ar-39Ar age of Kap Washington Group volcanics, North Greenland, Earth and Planetary Science Letters, v. 303, no. 3-4, p. 203–214. Thiede, D.S., and Vasconcelos, P.M., 2010, Paraná flood basalts: Rapid extrusion hypothesis confirmed by new 40Ar/39Ar results, Geology, v. 38, no. 8, p. 747–750. Thompson, R.N., Gibson, S.A., Dickin, A.P., Smith, P.M., 2001. Early Cretaceous basalt and picrite dykes of the southern Etendeka Region, NW Namibia: Windows into the role of the Tristan mantle plume in Paraná-Etendeka magmatism. Journal of Petrology, 42, 2049–2081. Trettin, H.P. (Ed. ), 1991, Geology of the Innuitian Orogen and Arctic Platform of Canada and Greenland, Geological Survey of Canada, 569 p.
Vermeesch, P., 2012, On the visualization of detrital age distributions, Chemical Geology, v. 312-313, p. 190–194. Villeneuve, M., and Williamson, M.-C., 2006, 40Ar-39Ar dating of mafic magmatism from the Sverdrup Basin Magmatic Province, in: Scott, R.A. and Thurston, D.K. (Eds. ), ICAM IV Proceedings, Dartmouth, Nova Scotia, p. 206–215. White, R.S., and McKenzie, D., 1995, Mantle plumes and flood basalts, Journal of Geophysical Research, v. 100, no. B9, p. 17,543–17,585.